The Samyang XEEN lenses have been meticulously calibrated to shoot high-quality video, boasting superb optical performance and versatility. 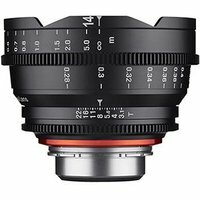 The Samyang 14mm T3.1 XEEN Cine Lens offers a wide angle of view, along with declicked gear rings, a solid aluminium build and X-Coating technology. Perfectly optimised for 4K, the Samyang 14mm T3.1 XEEN Cine Lens offers superior performance in an affordable package. This version is for Canon EF mount.